After I came back from my holiday I had so much energy, I decided to take some extra hours at work. Well, decided it`s code for my boss going on a holiday after he had to work extra because I was away for a month. The point is I was happy to do it, he`s an amazing boss, I was in a good mood and that also meant extra money. Money that I can use for books! While I was away I watched many Booktubers and these are all books that they raved about, so I decided to read them as well. The main attraction is the Miss Peregrine`s Peculiar Children Boxed Set by Ransom Riggs. I heard so many wonderful things about this trilogy and this set is beyond gorgeous! You have the three books in the hardback edition, with those beautiful covers and also, a special collector`s envelope of twelve peculiar photographs, which I think represent characters from the book. From what I understood, it`s about a 16-year-old boy named Jacob that travels to a mysterious island where he find an abandoned orphanage and soon realizes that the kids that lived here had some kind of powers. And they might be dangerous and alive. Now, imagine my surprise when I was in my local British Heart Foundation and I spotted the first four books in The Mortal Instruments series by Cassandra Clare. They were 2.65£ each and they were in excellent condition. I saw the movie with a friend and it seemed really interesting, so I can`t wait to read the books. I also picked up 2 YA contemporary novels. 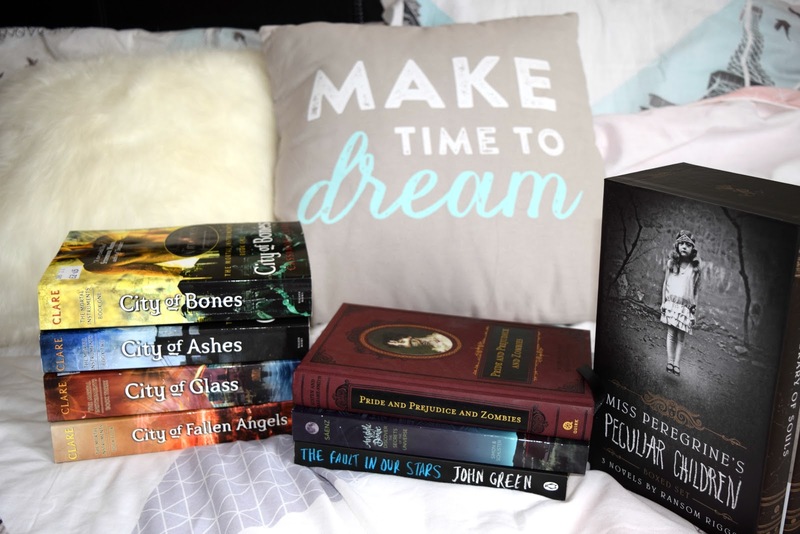 The first one is The Fault in Our Stars by John Green and I`m probably the only one that has not read the book or seen the movie, but I`ll fix that. As you might be aware, it`s a tragic love story about two teenagers with cancer and I can guess the outcome, but I`m still interested in reading it. The other YA book that I picked is Aristotle and Dante discover the secrets of the Universe by Benjamin Alire Saenz. It`s a book about friendship and accepting who you are, following the story of Ari and Dante, two boys that against all odds, develop a special bond. And the last book that I bought was Pride and Prejudice and Zombies by Jane Austen and Seth Grahame-Smith. This is such an embarrassing confession, but I could never get into Jane Austen`s novels. I love the classics, I really do, but her books always bored me. Hopefully, now that this has zombies in it I`ll enjoy it more and who knows, maybe it will make me want to read the original. A lot of these books are also on my March To Be Read list, so if everything goes well most of them will be reviewed this month. 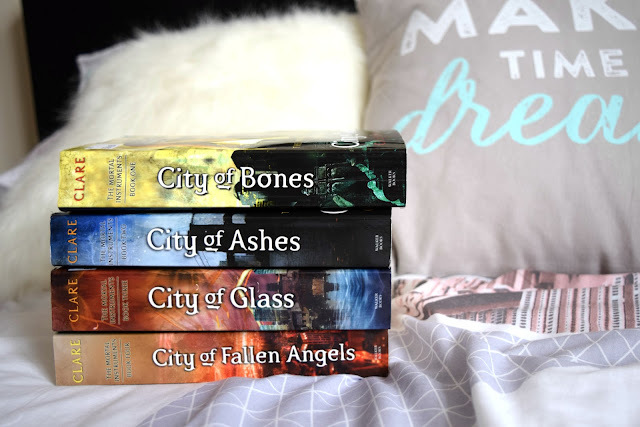 Did you read any of these?I`m curious to see what are your thoughts on them and if you can recommend other books, with similar plots. I did love watching her book adaptations, but this year I`m trying to read the books as well.Fingers crossed! I love the Mora Instruments, but the first three books are the only ones worth reading since it was made to be a trilogy. The author tried to extend the storyline and it just got a bit...boring. The first three are fantastic though! Everyone has been saying the same things about them, that the last ones are repetitive. I`ll read them regardless, to see how it ends. I feel the same about the Mortal Instruments she has carried them on too long but still good regardless, the film was terrible though. You should watch the series on Netflix it is so much better. I actually prefer the movie to the TV show,because it`s closer to the book. But in the tv show they skipped a big part of the love triangle, so I`m grateful for that.